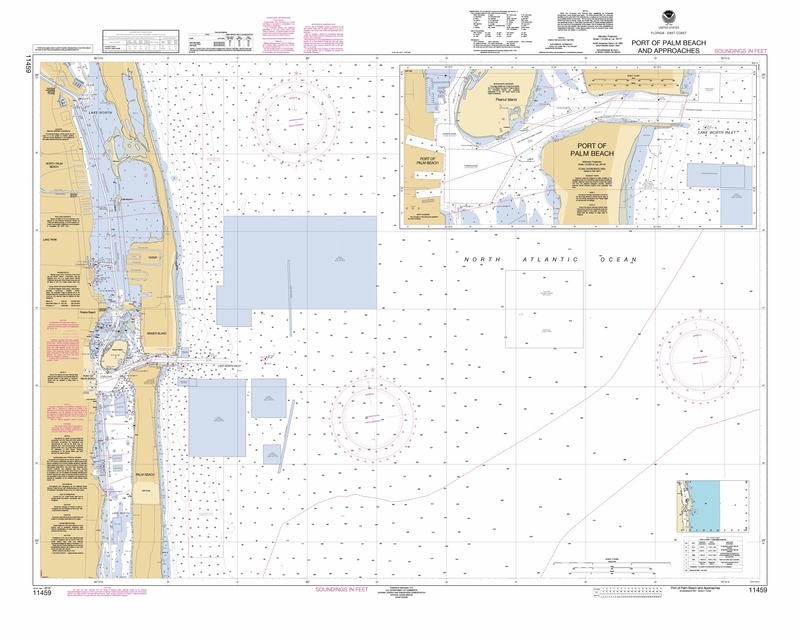 NOAA’s new nautical chart (11459) for the Port of Palm Beach, Florida. NOAA has issued a new nautical chart for the Port of Palm Beach, Florida, an important distribution center for commodities being shipped all over the world, and especially the Caribbean Basin. The Port of Palm Beach operations include containerized, dry bulk, liquid bulk, break-bulk, and heavy-lift cargoes. It is the only port in South Florida with an on-dock rail where the Florida East Coast Railway provides twice-daily service to the port’s rail interchange. 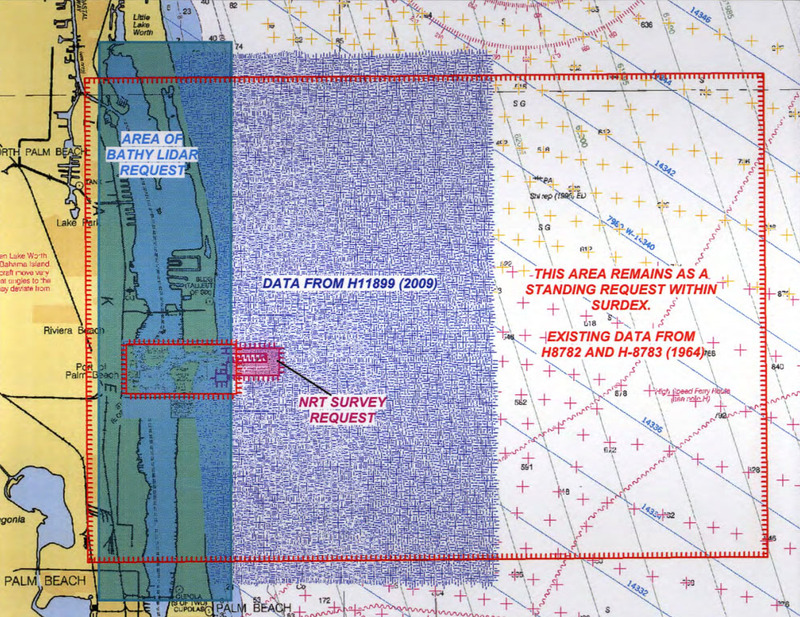 The Palm Beach Harbor Pilots Association asked Coast Survey for the new chart, citing the dangers confronting navigators who approach the port and anchor offshore using the small scale coverage and corresponding lack of detail currently available on chart 11466 (1:80,000). With more and bigger vessels entering the port, the larger scale inset helps pilots navigating within the turning basin and surrounding infrastructure. This is especially important because it is located within the traffic flow of the Intracoastal Waterway. In consultation with the Palm Beach Pilots, the U.S. Coast Guard Sector Miami, Port of Palm Beach (Operations Division), and the Army Corps of Engineers Jacksonville District, Coast Survey developed the new chart specifications. All parties agreed that the new 1:15,000 scale chart and a 1:5,000 scale inset would enhance navigational safety and greatly benefit port operations. In order to create the new chart, new data had to be collected. The National Geodetic Survey’s Remote Sensing Division collected additional bathymetric lidar data along the shoreline and Coast Survey’s navigation response team collected hydrographic data in the area just beyond where the U.S. Army Corps of Engineers data ends.